Peach Pound Cake made with cake flour, Peaches and Cream Liqueur, fresh peaches, peach icing, and sprinkled with almonds. Preheat oven to 325 F (163 C). Prepare a 10 cups/2.4 liter bundt pan. In a small bowl stir together milk, Peaches N Cream Liquor, vanilla, and greek yogurt. Add butter and sugar into a separate medium mixing bowl. Cream together using a handheld mixer. Drop eggs in one at a time and continue to mix until smooth. Pour in milk and liquor mixture. Mix on medium speed until smooth. Spoon dry mixture into wet and mix well. Fold in peach chunks with a spatula. Pour batter into bundt cake pan. Bake for 50-60 minutes or until toothpick inserted into center comes out clean. Allow cake to cool upside down on rack for 15 minutes. Flip upside down and let cake drop onto cake dish. 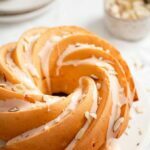 When cake is completely cool, drizzle with icing and top with chopped almonds. Store in an air tight container at room temp for 4-5 days.